My mum gave me her recipe for scones while I was living away, i used it quite frequently but since I’ve come home I’ve stopped making them as much. I don’t know whether it’s due to having an overdose of them, but i feel it might be more so one of those “traits” of being away. Whenever I’ve lived away, I’ve clung onto things that reminded me of home, not in a homesick way, more of a connection way. Certain things that i didn’t realise made such an impact… like in search of different food stuffs, beauty products or plain everyday things that really shouldn’t of made a difference. I used to google nearby cities that may stock this 1 thing that i used to only use rarely while at home… but when i was living away, I HAD to have it. Now that I’m living back in Ireland, I find myself longing for products or foods that i replaced with the Irish ones. I guess it’s a warning trait that I’ll never be fully happy where I am, and I’ll always want to be in the next place or the place i was just before. Begin by heating the oven to 200°C or 400°F and prepare a baking tray with baking paper or a silicone sheet. In a large bowl, sieve in the flour, cream of tartar, baking soda and salt. Add in the cubed butter and with your fingertips rub into the dry ingredients until you still have some small lumps of butter but you have a breadcrumb like consistency. Add the sugar into the bowl and stir until combined. Mix the egg and buttermilk in a small bowl and stir into flour mixture until moistened. Turn dough out onto a lightly floured surface, and knead briefly, just until it comes together. Roll out dough to around 1.50cm in thickness and cut out as many rounds as possible, approx 12. Place on the baking tray and brush tops with a little buttermilk, sprinkle with sesame seeds and a little sugar. Bake for 25mins or until a golden brown colour. Leave to cool on a rack for a few minutes before serving them up with some jam and clotted cream. Great story lovey scones you do Mammy proud. i love scones. these look great! So do i! Thank you Dina! Thanks Vladislav!! Let me know how you get on if you make them!! Close, but not that close. Thanks Kate! 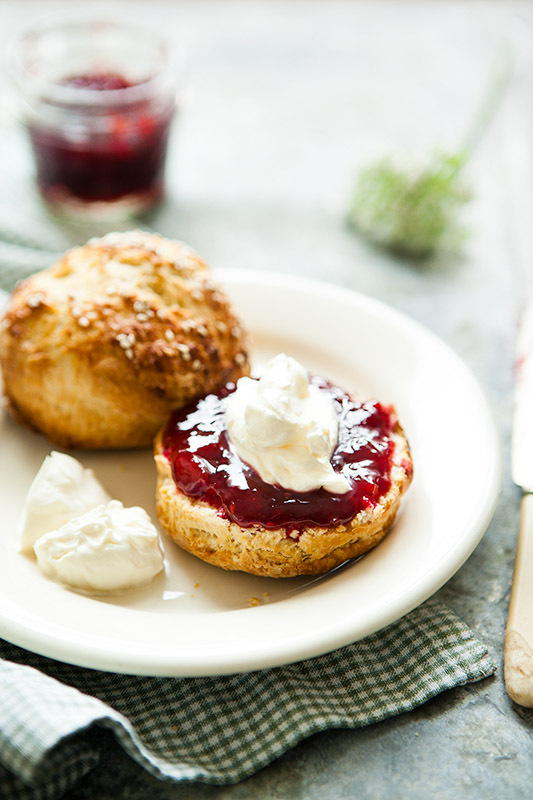 A warm scone with jam and cream can be one of the most comforting bakes. These look perfect! Thanks lucy, they’re just so homely!